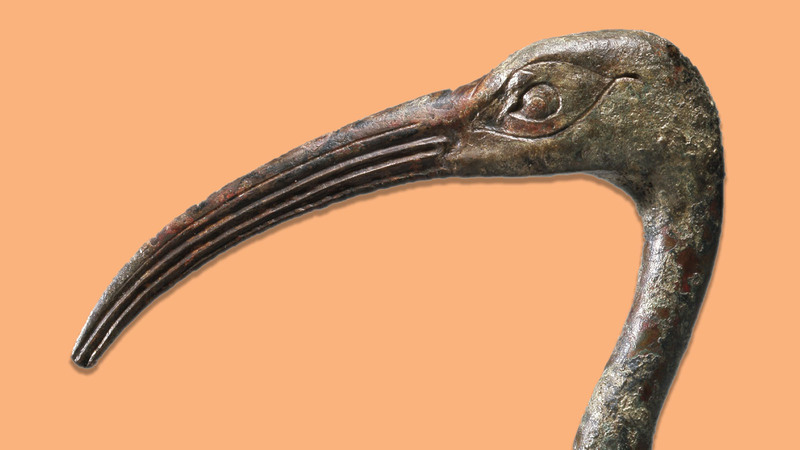 Ibis Head. Egyptian. Late Period, 722-332 BC. Bronze. Gift of Mohamed Farid Khamis and Oriental Weavers. Photo by Bruce M. White. Experience birds in the woods, the galleries, in song, and more. The Carlos Museum, the Atlanta Audubon Society, the Emory Chamber Music Society of Atlanta, Theater Emory, the Emory Planetarium, and the Emory Libraries invite you to a celebration of birds across the arts. Start the day with a bird walk through Emory’s Lullwater Preserve, guided by members of the Audubon Society. Lullwater features features old growth forests, Candler Lake, and meandering trails, and is home to owls, woodpeckers, nuthatches, Eastern Bluebirds, hawks, and the Belted Kingfisher among others. The duration of the walk will be three hours with two to three miles of walking. No restroom facilities are available, and no motorized vehicles are allowed within the preserve. The group will meet in front of the Clifton School (Clairmont Campus) at the end of Starvine Way. Parking is free at the Clifton School or, if the parking lot is full, please park in the Starvine Visitor Parking Deck. The walk will begin promptly at 8:00 AM, so please allow time to park and assemble in front of the Clifton School. Please bring any supplies you may need, including binoculars, comfortable walking shoes, rain jacket, field guides, water, snacks, etc. Space is limited, and registration is required here. Drop by the Jones Room in Woodruff Library to view the complete four-volume set of 485 Birds of America plates by John James Audubon, issued by Atlanta’s Abbeville Press in 1985. The volumes are double elephant folios, and each one weighs approximately 40 pounds. Admission is free, and visitors may arrive at any time during the two-hour event. A pair of star-crossed lovers united by a magpie bridge, a friendly flock rescuing a moon-faring mole, even a flying emu! Cultures all over the world have imagined birds in the patterns of the night sky. Hear some of their stories in an original program titled Birds of the Night Sky presented by Dr. Erin Bonning, director of the Emory Planetarium. Space is limited, and free admission is on a first-come, first-served basis. Sorry, but no late entry is allowed. Hands-on art activities appropriate for all ages will be stationed around the museum. Included with the cost of admission. The Carlos galleries are a virtual aviary, abounding with artistic interpretations of birds across cultures and in all media. Museum docents will lead tours every hour on the half hour, departing from the Rotunda. Included with the cost of admission. Theater Emory presents a hilarious abridged reading of The Birds, Aristophanes’s fantastical comedic satire on the degeneration of society. Two gentlemen of Athens, revolted by the corruption of their hometown, travel to the high place where the birds dwell. They persuade the birds to war with the gods and establish their own kingdom by reminding them how they have been treated by humanity. The Vega String Quartet with violinist Helen Kim and pianist Elena Cholakova perform Vaughn Williams’s Lark Ascending, selections from the Catalogue of the Birds by Messiaen, the Lark String Quartet by Haydn, and the traditional Catalan folksong Song of the Birds for solo cello.